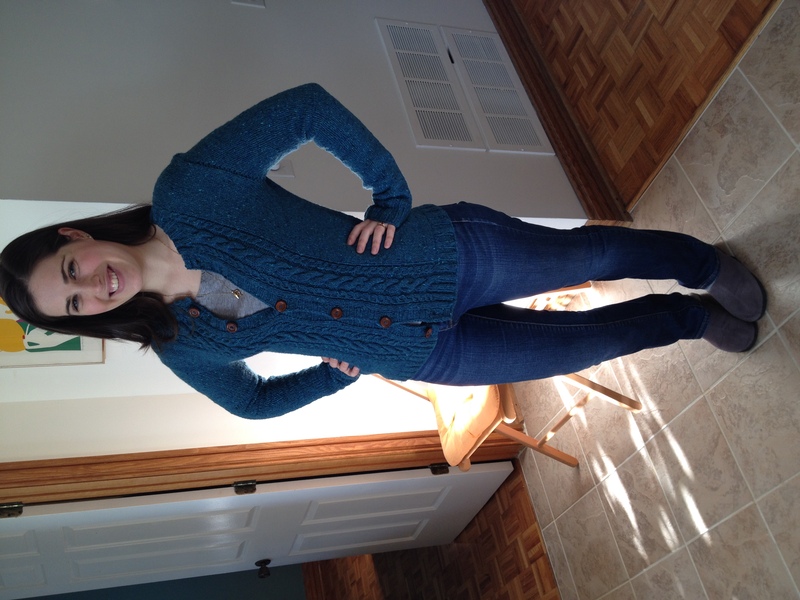 I got the pattern for the Alpenglühen cardigan on Ravelry. It was recommended to me by a friend for a first sweater, as she said the pattern was excellent and easy to follow. It really is! If you’re looking for a pattern for your first sweater, try this one. 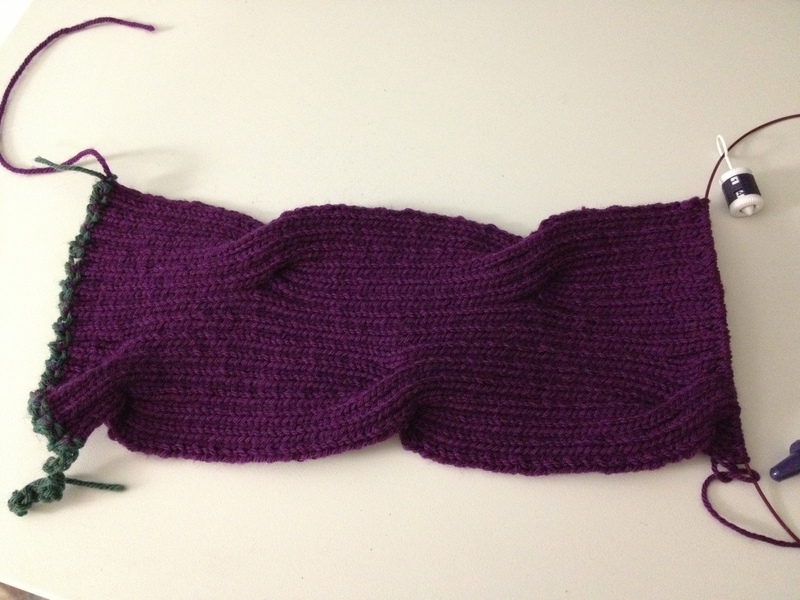 Since this was my first try at a garment, I decided to go by the book and make a swatch. It turns out my gauge was perfect. The yarn is Studio Donegal’s Soft Donegal. It’s 100% merino wool with a tweedy, multi-colored flecked texture. My parents bought it for me in Dublin, Ireland last year and gave it to me as a Christmas present. 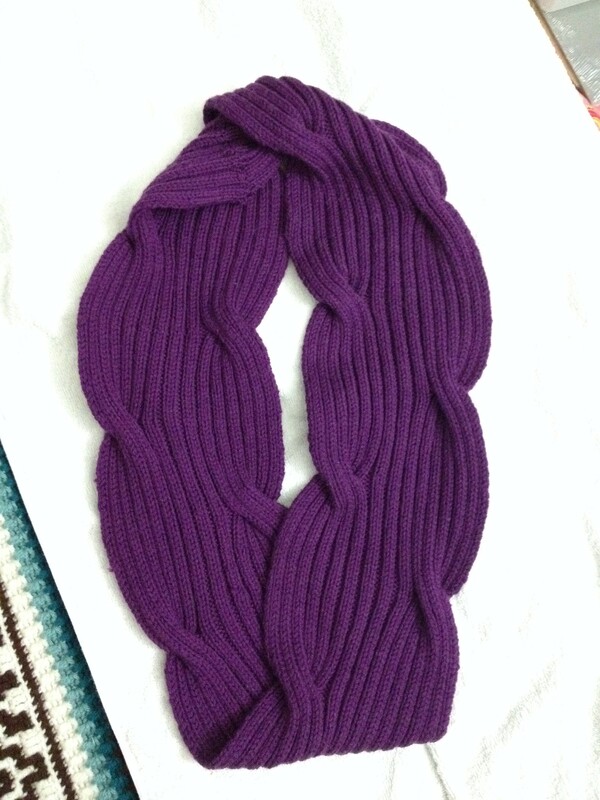 It’s a gorgeous color, soft, and even the jersey knit gives a nice stretchy result. I love it. 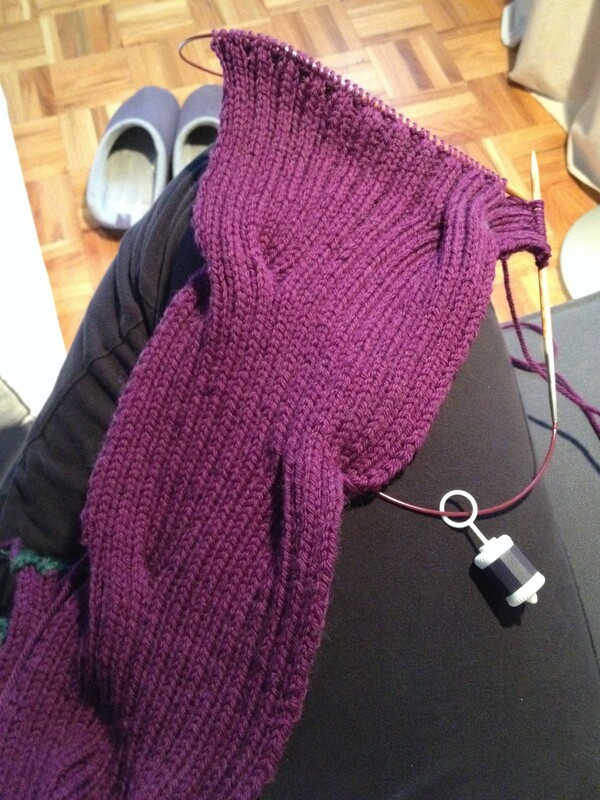 Though I’d done cables before, this was my first big cabled piece, and darn it if I didn’t make a mistake in one of my cables only to realize it 10 rows later. The horror! What to do?! Rip out 10 rows of work? Ignore it and pretend it’s not there only to have it haunt my dreams? No. A solution had to be found. Enter social media. 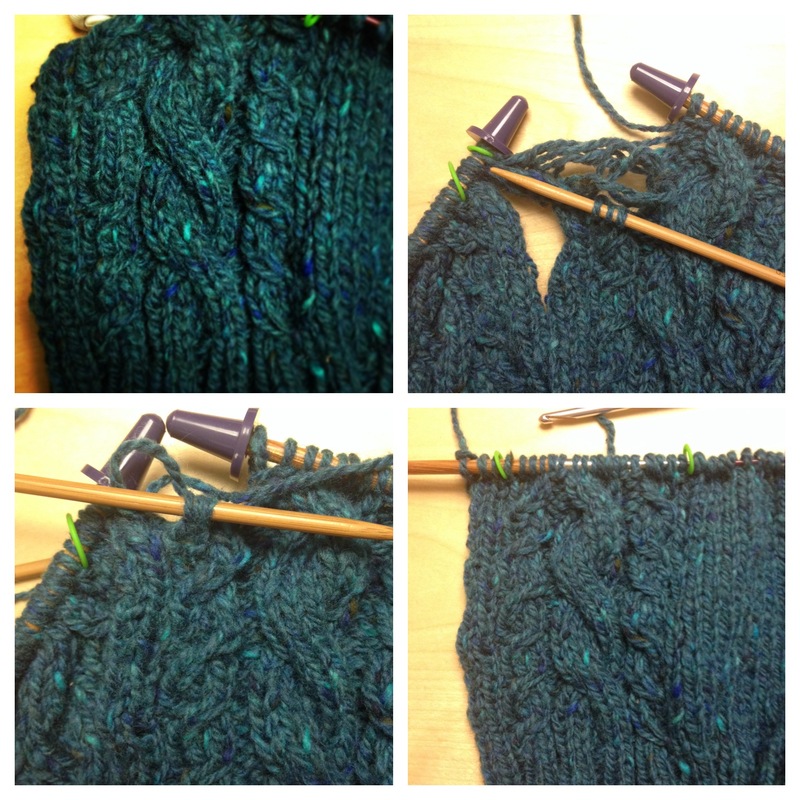 The Knitting Lodge community on Google+ is a great resource where lots of experienced knitters hang out. I posted a cry for help there, and also contacted Staci Perry of VeryPink Knits on Google+. She kindly sent me her video for correcting a stitch. After studying the blog posts provided by the Google+ knitters and Staci’s video, I was ready to pull off the most complicated knitting technique I have done to date. Holding the stitches on either side of the three offending stitches on my needles, I proceeded to drop down to where I had forgotten to cable. 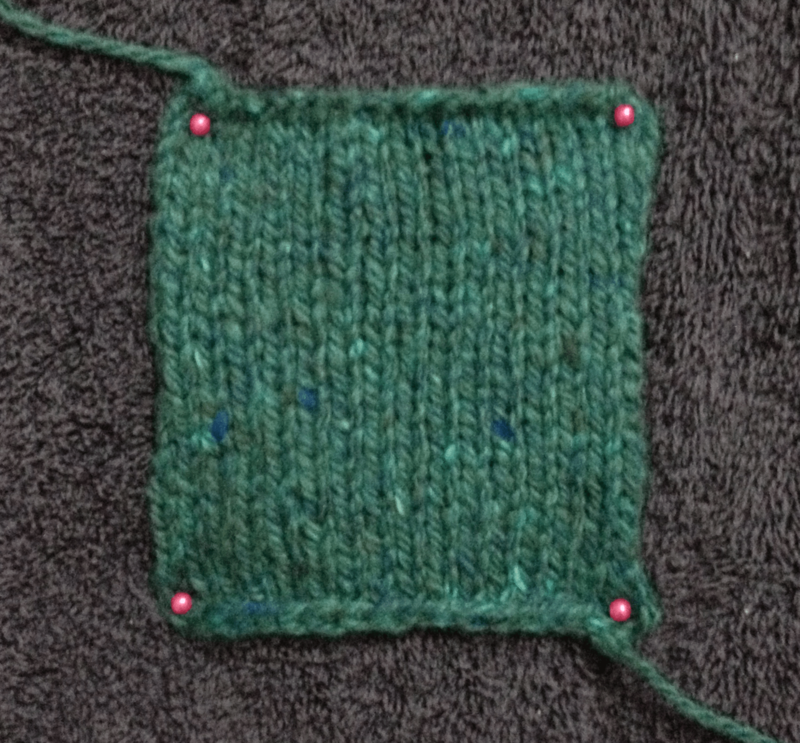 Then, using a crochet hook and a knitting needle, I worked my way back up using Staci’s technique. My Chico will tell you that I held my breath for about 15 minutes while doing this. Afterwards, when I had successfully accomplished my mission, I felt like the KNITTING QUEEN OF THE WORLD! Lots of high-fives ensued. The back of the sweater is nicely fitted. However, it requires what seems like MILES of jersey stitch. It’s hard not to pull out your measuring tape every few rows to check how you’re doing. The best advice I can give is to try to get through this part of the process as quickly as possible. The back is wonderfully fitted! I had some issues with the wrap & turn required for creating the shoulder cap of the sleeve. 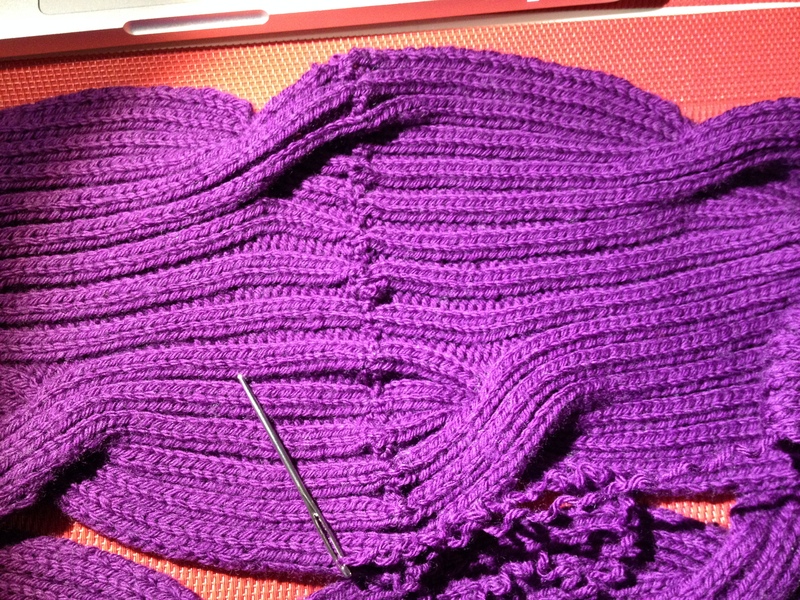 The wrap used to create the short rows caused a gap along the seam where I picked up from the main body to knit the sleeves. I was unable to find a solution for the problem. I tried several techniques, including the Japanese short row technique, but none worked any better. My final solution was, when I was putting the finishing touches on, to just sew through the seam inside out. On a sweater like this, the buttons really bring it all together and give the final finishing touch. I wanted to splurge, so I visited Rix Rax here in Montreal. The selection of buttons is vast, but expect terrible service with a healthy dose of bad attitude to go with it. It took me about a month and a half to finish this sweater. And when I finally blocked it out and sewed on the buttons, I could not wait to wear it. And wear it I did. I wore it to work twice in one week. My colleagues humored me by complimenting me every few minutes. Whenever I wear it outdoors, I can’t help but expect strangers to stop me on the street and say, “What a nice sweater!” I am inevitably disappointed when no one in the grocery store takes notice. But… I MADE IT MYSELF! !